There is a wide variety of water birth pools, ranging from simple, inexpensive baby portable pools, to large, built-in Jacuzzi. Water birth pools and baths in hospitals and maternity centers are usually specially designed for childbirth. However, if you are going to give birth at home, you must consider some aspects while choosing a water birth pool. Will it keep the water warm? Some pools have a heating device. Some retain the temperature of the water without changing water, while others change water so that the temperature remains optimal. Each pool the birth should have a thermometer, built-in or as an optional accessory, to show the water temperature. The water temperature should not exceed 38 °C, so that the mother doesn’t have any dehydration and the child — palpitation. The ideal temperature for water birth is normal body temperature. It is important not to get overheat during labour. If is too hot, it can affect the baby’s heartbeat. If you feel hot, cool off your shoulders or exit the water birth pool and walk a little. Do not forget to drink to avoid dehydration. What about colder temperature? Infants, unlike adults, have no internal thermostat, that can regulate the temperature changes, which creates the risk of hypothermia if the child is in cold water for a long time; but close contact with the mother helps the baby regulate body temperature. Some researchers believe that cool water can start breathing mechanism of the newborn before it will appear on the surface, therefore, such situations should be avoided. However, it is known that many women give birth in the open waters of the Mediterranean and Black seas, and even in colder waters without any unpleasant effects. Further research is needed to finally figure out the danger of cold water to a newborn. Does the water birth pool fit? Make sure that your water birth pool is not too big and not too heavy for the place, where it will stand. A water birth pool should be deep enough to ensure freedom of movement and possibility of the best pain relief. The pool should also be wide, so you can easily change position during labor in water. If you expect that your husband will help you, make sure that there is enough space for two. How about cleaning and disinfection? There are water birth pools with water filtration systems. Some pools require chemical disinfection. There are birth pools with a disinfecting liner (cladding). Many inexpensive home birth pools require frequent changes of water to maintain cleanliness and disinfection. In Britain, many women prefer to give birth at home in water birth pools. However, the local health organizations urged women who are planning such delivery, to refrain from it because of the risk of legionellosis. An emergency warning was issued after a baby, born in a pool, was diagnosed with this disease. The British women were asked not to give birth in the heated pools until a full investigation of the situation, which was called «very serious». A few years ago in Italy and Japan cases of bacterial infection in babies born in water birth pools were also recorded. Is the color of your pool light enough? 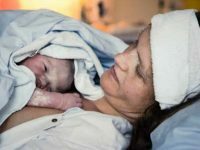 If the color of the water birth pool is too dark, it can make the job of your assistant more difficult, because he or she will not be able to see the process of the childbirth. There are light bulbs in some pools, a waterproof flashlight will also do. The best way is to place a light water birth pool in a well-lit room. The water birth pool in the picture is not the best variant! Is the water birth pool convenient enough? Some water birth pools have built-in seats, removable or attached to the sides, jet pumps and other additional facilities that will make the birthing process more comfortable. Can it be easily installed? Perhaps this question bothers you the least, but if the installation instructions of the pool have the size of a telephone directory, you will hardly want to do it before the birth.